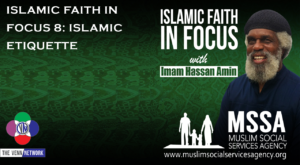 On this week’s Islamic Faith in Focus podcast with Imam Hassan, he addresses Islamic etiquette –as in how a Muslim should speak and interact with other people. Using the example of the Prophet Mohammad (pbuh) the Imam explains that The Prophet didn’t use a lot of extra words, he didn’t talk just to hear his own voice, he spoke when he had something to say, and when he did he got right to the point. Pretty much saying that sometimes less is more when it comes to addressing people. Muslims are not supposed to back-bite, curse, or be derogatory to one another or in speech. If they are, that is not from Islam – rather it is from that person’s character. The Imam reminds us that our words will be used to judge us on the final day, and that kind and sweet words will help us – and the nonsense we speak, the hurtful words we utter, the garbage that fall out of our mouths will be help against us. So, remember to always speak kind words. In short, before you open your mouth think about what you are going to say…and as your mother used to say, if you don’t have anything nice to say, don’t say it anything at all.